... and have it shipped to you or your customer within 24 hours today! WHY SHOULD I USE PAYMENT COUPON BOOKS? If you’re into selling cars or houses, or a vendor/dealer/owner who wants to ensure that you receive payments from your customers or clients on time and exact, then you can start sending them payment books. 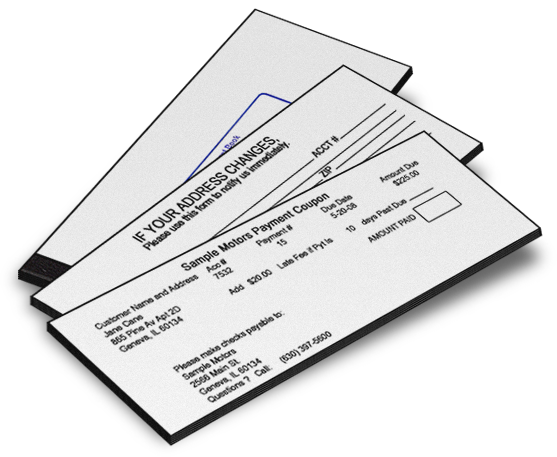 A payment booklet contains slips that you can give to your customers, and in return, they send it back with a check or money order to pay the bill due. It is also a way to keep a record of your payments, both for you and your customers. American Access is a pioneer in the payment compliance arena. We have over 30 years of experience in automotive sales, financing, and collection. Order one payment book at a time or many. Over 30 years of experience in automotive sales, financing, collection and printing business. Pay by Credit Card or ACH Only $8.99 per payment book + shipping. Contact us for dealer pricing. 30 Day Money Back Guarantee is available in every order. No questions asked. Order personalized payment books for your customers today and receive payments on time. With your brand on it.